Mumbai Indians registered their 1st win in IPL-8 by defeating the Royal Challengers Banglore by 18 runs in the M.Chinnaswamy Stadium, in a game where Rohit Sharma supported by Unmukt Chand and Lendl Simmons pulled strings and carried off their team to victory. Mumbai Indians who were invited to bat first by the home team made few changes and it seemed to work in their favour, they brought in Simmons,Chand and Pandya and all three were the shining stars for MI. Mumbai's Simmons and Parthiv Patel inaugurated the innings brilliantly, Parthiv was bowled by Wiese for 12 and then walked in the 22 year old Delhi lad playing his debut game for the Mumbai side, with immense confidence took Nechim to the cleaners. Simmons and Chand went on to stitch a 72 run stand. Unmukt and Simmons set the plot for the big total and Rohit Sharma took the reigns in his hands and bolstered the lads from Mumbai to reach 209. With the departure of Lendl Simmons(59), the MI skipper Rohit Sharma took it upon himself to rudder his team to victory. Rohit Sharma and Unmukt Chand got back the firework in the Chinaswamy Stadium. The Captain supported the young gun who got his maiden half century, after playing a splendid knock for his side, Chand departed for 58. Pollard and Rayudu followed him soon without causing much of destruction. MI skipper Rohit played his part and suddenly the Mumbai team collapsed. Hardik Pandya opened his account for the Mumbai Indians with a six, and played some big shots which helped Mumbai Indians reach 209/7 in 20 overs, Harbhajan Singh being run out on the last ball. Nothing seemed to work in the favor of the home team today, neither their bowling nor batting or fielding. Chris Gayle who is an important ingredient in RCB's key to success formula departed early, the likes of Virat Kohli and Dinesh Karthik too failed. As the RCB skipper and his left hand Chris Gayle went back to the pavilion, the hopes of the Banglore fans kept sinking. There was only one man who could save them and it was the South African Captain, who did not spare the bowlers and gave boys from Mumbai a taste of their own flavour. 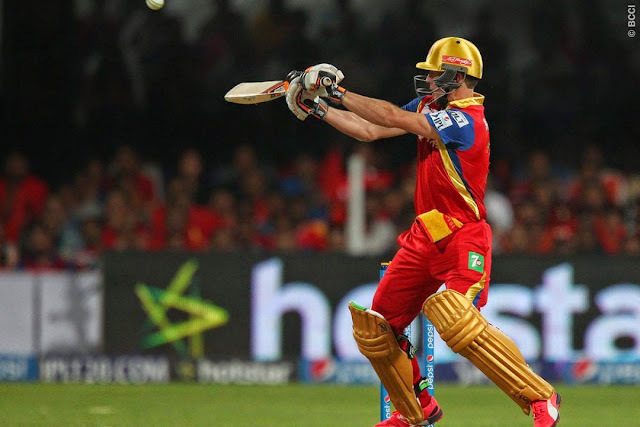 AB de Villiers(41), went hammer and tonks before MI dismissed him to all but seal the match. David Wiese(47) came toward the penultimate overs and endeavored to rescue RCB, but he was too late and failed to play a miraculous innings which could have turned the tables around. It would have been wise if Captain Kohli would have promoted de Villiers before Karthik, as ABD could have bent things in the Challengers favour. This man was there whenever the team needed him and delivered his best, helping the MI team to end their losing streak,thus Harbhajan Singh was given the Man of the Match award. The T20 extravaganza continues as the Delhi Daredevils take over the Kolkata Knight Riders at Feroz Shah Kotla tomorrow.